Sail Area 785 Sq. Ft.
Bridge clearance 54 ' 6"
9 oz. Main / 3 reef pt. - 294 sq. ft.
Roller Furl 9 oz. 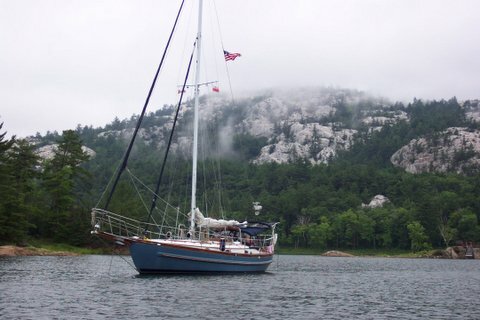 Staysail 196 sq. ft.
Merriman genoa and staysail cars. (1) #18 STC. Main Sheet. (1) #18 STC Main Hly. 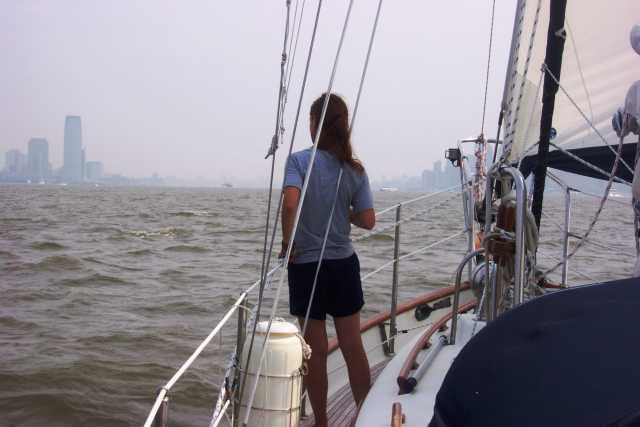 (2) #10 STC Staysail Sht. • Brass saltwater hand pump at galley. • 2 Electric bilge pumps with auto switches, new in 2002. • 8 gallon hot water tank with engine exchanger heat. • Double S/S sink in galley. • Ocean Breeze central Air (16.5K BTU) & Heat by, Quorum Marine. • Bronze thru-hulls with ball-valve seacock’s. • Manual marine toilet. 40 gal. holding tank with manual pump out and deck evacuation. 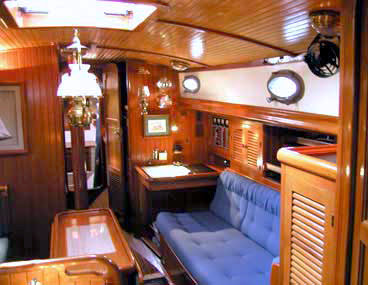 • Teak instrument box over companionway with B&G network instruments (Wind Speed/Direction, Depth, Speed). with repeater at nav. tbl. • 11 brass port holes. • 2 Hood hatches salon/head. • 4 S/S Dorade vents fitted with screens and storm plates. • Teak weather decks, and teak cabin deck inserts. • S/S mast pulpits with pinrails. African teak bowsprit with stainless steel pulpit and dual bronze anchor rollers. • Electric horizontal windlass with wildcat & rope gypsy. • Integral molded rub rail with teak insert and SS protective cap. • Stainless taffrail with custom built in ladder that extends 4’ in the water, and integral davits made by Tops In Quality. • Dodger, bimini & full cockpit enclosure for weather protection & shade. • Teak caprail and side boards. • Teak handrails & trim on cabin trunk. • S/S traveler with American X track and bearing car. • Oversized S/S genoa & staysail track. • Oversized rod bob stay. (Adjustable). • 4 Cockpit drains with seacock’s. • Rosewood compression post properly drilled for mast electrical cables. • LED navigation, deck, anchor lights. • Brass backing plates bonded to coach roof in areas where winches are installed.